A few weeks ago our Digital Director pointed us to a site called Pinterest, which is basically a very visual social bookmarking site. My formula for social sites is to join them -- I join just about everything that comes my way -- set up a profile and play with it for a few minutes, then see if I ever go back to it. Occasionally I'm drawn back on my own, but it's usually because I start seeing more buzz about the site and revisit. It's my way of gauging a site's potential popularity and therefore its potential usefulness for our clients. If I join when a site is new, I can kind of see how the noise increases over time, and also gauge my own level of interest. Our Director loves Pinterest so much that I was planning to go back and explore it more anyway, but I've also been seeing some buzz. Some of my coworkers have joined and seem to like it, and I've been seeing the name pop up here and there on the various social networks. So tonight, I went back and really spent some time exploring, and I love it. Initially it reminded me a lot of Kaboodle, which I've used for a few years, but on closer inspection the visual aspect of Pinterest makes it feel different. Kaboodle is more about collecting things that you want to buy. Pinterest seems like it's more about collecting images that inspire you. I feel like you really get a sense of someone's personality looking at their overall collection of images. The concept is this: you have 'boards' (categories) which contain collections of 'pins' (images of art, design, clothing, sites, etc.). As you browse the internet, you can use Pinterest's bookmarking tool to add pins to your boards (you can also input the URL directly), or you can browse through other people's boards and repin from there. You can follow another person's individual board, or follow them all. Social functions include following, repinning, commenting, and liking. 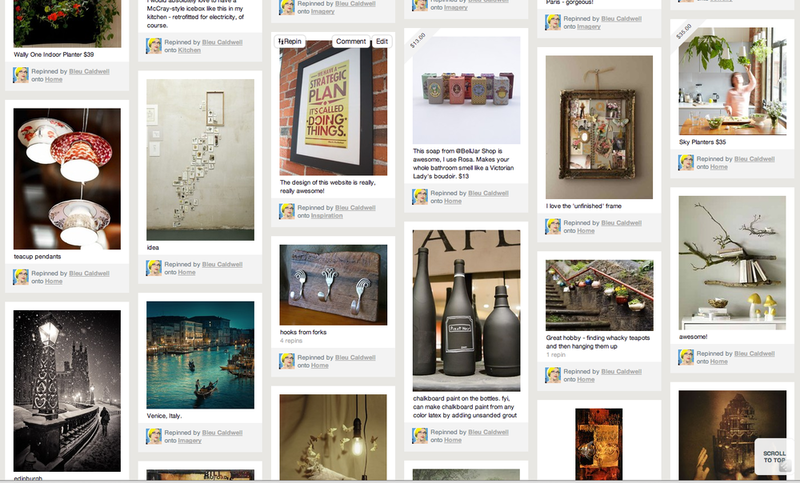 You can also share individual pins on Twitter, Facebook and StumbleUpon, as well as embed or email them. Overall, it pretty cool and fairly addicting. There are so many great images to collect, and it's a great place to amass ideas for interior decorating, DIY projects, recipes, creative inspiration, wish lists -- really, anything that is conducive to a visual collection. I encourage you to check it out, particularly if you're an artist or designer. I feel like this could be a great tool for people in the visual arts to collect inspiration for research and brainstorming, and maybe even to share your own work. Pinterest is currently invite only, but I feel like the invites are easy to come by. If you happen need one, though, feel free to message me on Twitter or Google+.